The work of PCA&D students was included in a presentation to a United States House Committee on Capitol Hill on Tuesday! As part of his testimony to the U.S. House Agriculture Subcommittee on Nutrition’s March 28th Hearing “The Next Farm Bill: The Future of SNAP,” one of the witnesses, Joe Arthur, Executive Director, Central Pennsylvania Food Bank talked about the need to expand awareness of the SNAP (supplemental nutrition assistance program), featuring the theme and design created at Designathon 2017 for Lancaster County’s Community Action Partnership (CAP) which oversees the distribution of SNAP funds in Lancaster County. According to Arthur’s testimony, which also covered the local impact of the SNAP program within the service area of Central Pennsylvania Food Bank, only 55 percent of those individuals that are income eligible for the program are receiving benefits, meaning over 200,000 potential SNAP-eligible central Pennsylvanians are not in the program. 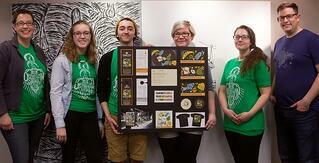 The Designathon team that created the SNAP design concept were PCA&D students Alicia Brooks, graphic design '18, Casey Capece, graphic design '18, and Austin Lord, illustration '18, assisted by Jessica Edonick, Dean of Student Services, and alumna Lisa Deangelo, graphic design ‘13. Michael McKenna, Chief Impact Officer of CAP, educated the team about the challenges hunger raises in Lancaster County and the benefits of SNAP. CAP is one of the partner agencies working with the Hunger Free Lancaster County Coalition. In addition to this shout-out in Washington, members of the team were invited to the Board of Directors of Hunger Free Lancaster County to see their work unveiled the coalition’s 28 affiliated organization, which also includes the Central Pennsylvania Food Bank. Left to right: Jessica Edonick, Casey Capece, Austin Lord, Alicia Brooks, Lisa DeAngelo,and Michael McKenna. During the 24 hour long Designathon, the team created a bus stop sign, rack card, banner ads, a door hanger, a post card, a t-shirt design, stickers, and social media infographics including an animated gif. This team was one of ten who created quality design work for area non-profits during the 2017 Designathon held February 24 and 25, the largest in the college’s history. The chair of Hunger Free Lancaster County, retired State Senator Michael Brubaker, said, “I am not exaggerating when I say that there were tears when many of us saw the marketing campaign. Brubaker also stated that the team created a suite of materials that the agency would have spent months and tens of thousands of dollars to acquire from a professional firm. Look for this campaign around Lancaster County. The 24-hour Designathon is an annual event held by the college’s American Institute of Graphic Arts Student Chapter (AIGA) that provides professional-quality design services at no charge to area non-profits and to the community-at-large. Students at PCA&D who participate in the Designathon gain real-world experience in creating projects for clients under a tight, 24-hour deadline. They learn that non-profits have very real marketing needs in order to be successful, and strong graphic design on well-organized collateral pieces are vital components in successful communications and marketing plans. More importantly, students experience the value of giving back to the community. Applications for the next Designathon, which will be held in February 2018, will be open in the fall. This will be the 10th annual Designathon, which began in 2008 by PCA&D's Graphic Design chair, Pamela Barby, as a way to involve her students in the Lancaster community.